It was a lovely and clean apartment in the centre of Ostend. I had a few questions before we went and emailed the owner who replied promptly and was very helpful. Will definitely stay at this property on my next trip to Ostend. The Appartment is very well located (2 minutes to the beach or to the town center) and is very good equipped! The kitchen is new and clean and there's reallye everything you'd need to spend a few lovely days (except towels and bedclothes as indicated in the description) The owner was very nice, we even locked ourselves out of the appartment once in the middle of the night and she drove all the way to us to open the door, not many people would have done that! De locatie was top! Op nog geen 2 minuten aan het strand en in het centrum! Ruime leefruimte. 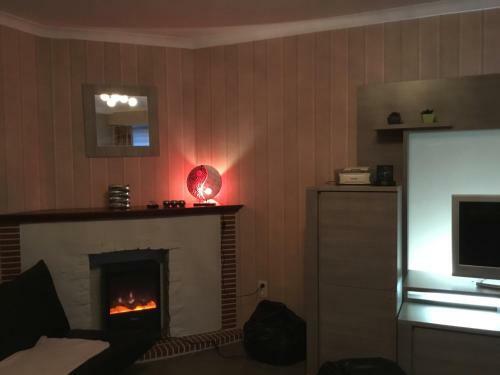 Perfect ligging en zeer mooi appartement voor een redelijke prijs ! De locatie was zeer goed, en het appartement had alles in huis wat nodig was voor een aangenaam verblijf. Die Lage ist perfekt, die Übergabe ist sehr problemlos auch sehr spät abends ( 23.30 Uhr ) Appartement sehr groß und sauber. Feinkosthändler direkt nebenan. Nicht weit vom Restaurant St. Tropez mit dem besten Couscous in Belgien. De ligging was perfect!!! Ook het verblijf zelf was mooi. Niet echt groot maar proper en netjes! We hebben een zeer leuk verblijf gehad! Lock in a great price for Residentie Casino Kursaal – rated 8.3 by recent guests! Residentie Casino Kursaal is located in Ostend. The property is a few steps from the Casino Kursaal and features free WiFi. The apartment comes with 2 bedrooms, a kitchen with a dining area, and a bathroom. A TV is offered. Popular points of interest near the apartment include Leopoldpark, Wapenplein Square and Mercator Ostend. The nearest airport is Ostend-Bruges Airport, 3.1 miles from the property. When would you like to stay at Residentie Casino Kursaal? House Rules Residentie Casino Kursaal takes special requests – add in the next step! Please note that bed linen and towels are not available at the accommodations and that guests are required to bring their own. Please inform Residentie Casino Kursaal of your expected arrival time in advance. You can use the Special Requests box when booking, or contact the property directly using the contact details in your confirmation. A damage deposit of EUR 150 is required. The host charges this 7 days before arrival. That's about 168.11USD. This will be collected by bank transfer. You should be reimbursed within 7 days of check-out. Your deposit will be refunded in full by bank transfer, subject to an inspection of the property. The kitchen and bathroom were not very clean. It was a bit impractical that we only had one key for 5 people for the whole flat, so you have to organise very exactly if you don't spend the day all together.